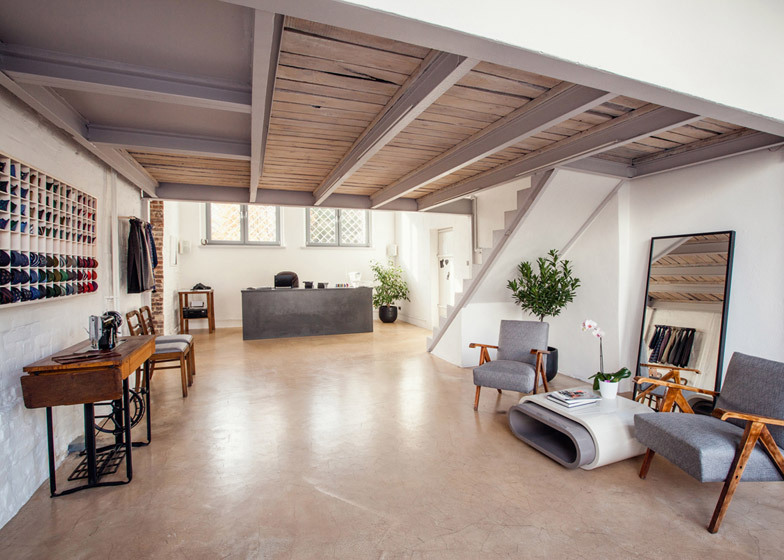 A concrete staircase ascends to a mezzanine office at this menswear showroom inside a former sewing factory in the Polish city of Katowice, which was renovated by architect Grzegorz Layer (+ slideshow). 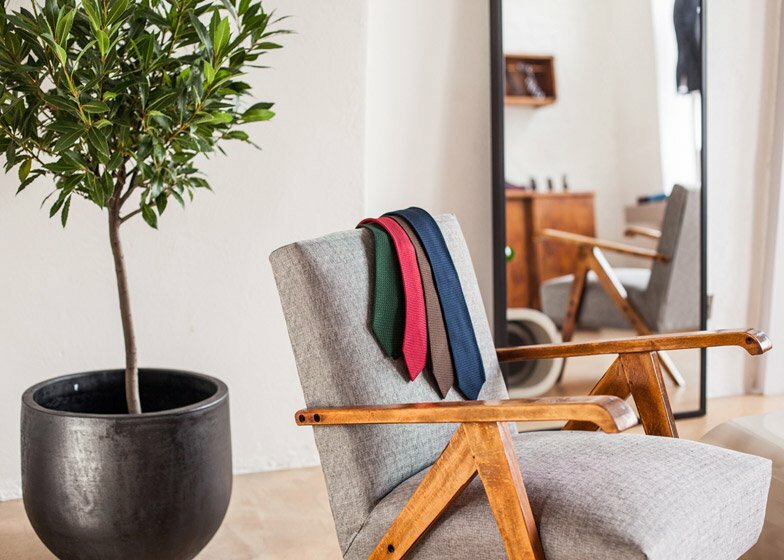 Grzegorz Layer renovated a two-storey space in the abandoned factory building to create a permanent showroom, sales office and workshop for mens accessories label Poszetka. 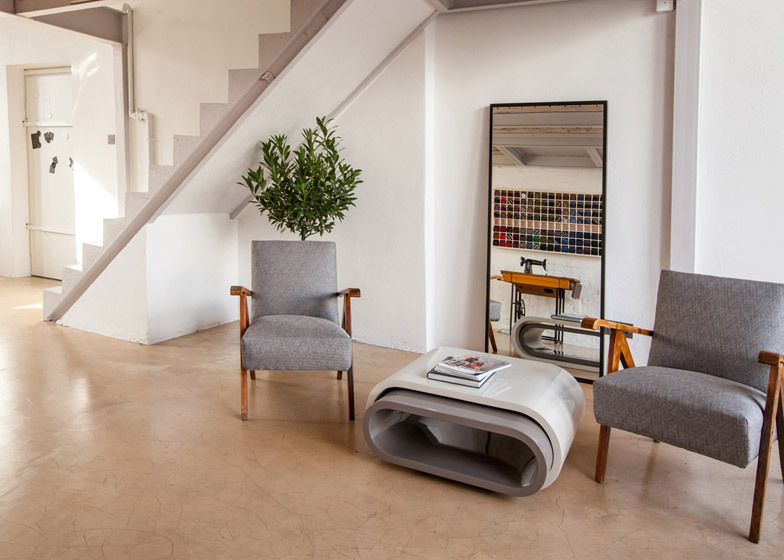 The building is located on a street that is home to other creative businesses and shops, including a boutique with stripped-back plaster walls that sells products by local designers. 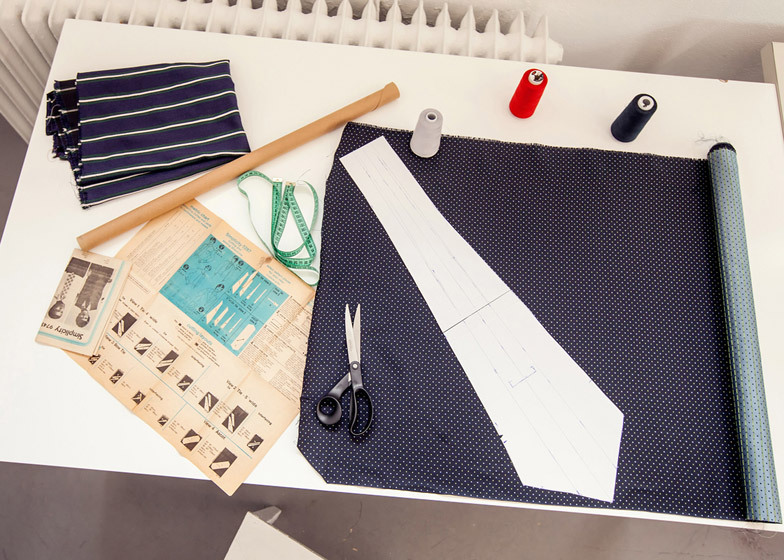 "Good company helped to take up the challenge which proved to be the revitalisation of a sewing factory neglected for years, although its potential could be felt from the very beginning," said owner Joanna Krajewska Godziek. Having previously operated the business from home, with sales limited to an online store, Krajewska Godziek decided to move manufacturing and sales to the new premises. The main space was previously divided into five smaller rooms but has been opened up to create a bright showroom with a shopfront at one end and large windows behind the sales point at the other, filling it with natural light. An original mezzanine crossing this space has been converted into an office, which is reached by a simple concrete staircase supported by metal beams. The textured wooden floorboards and beams on the underside of the mezzanine are left exposed and create a feature in the showroom below. 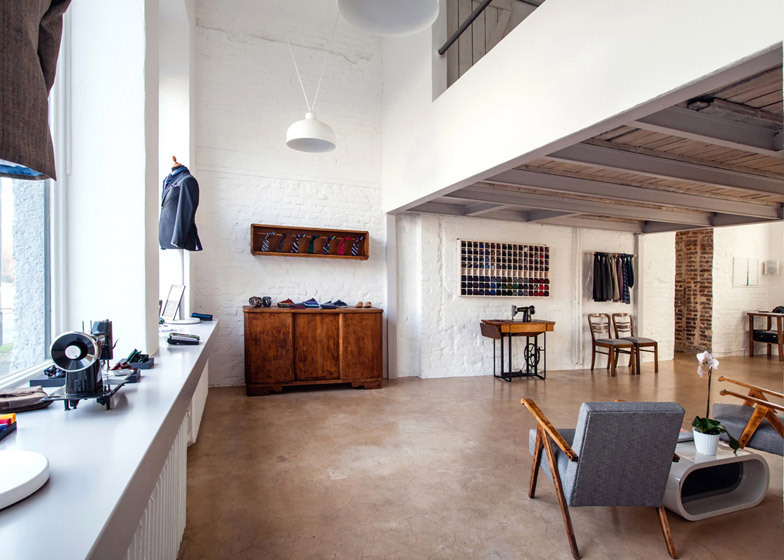 Original details including metal doors, hooks, clothes hangers and lamps were retained and used within the interior to create a link with the building's history as a place of manufacturing. A sales desk installed towards the rear of the ground floor space is also used as a work space where customers can see the products being created. 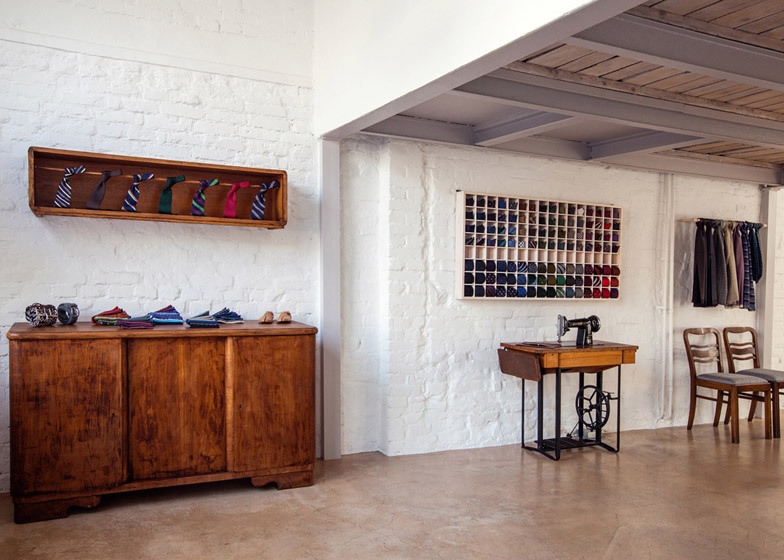 A doorway next to the sales point flanked by raw unpainted brick walls leads to a tailoring workshop containing storage for fabric and equipment for transforming it into ties, pocket squares, bow ties and scarves. 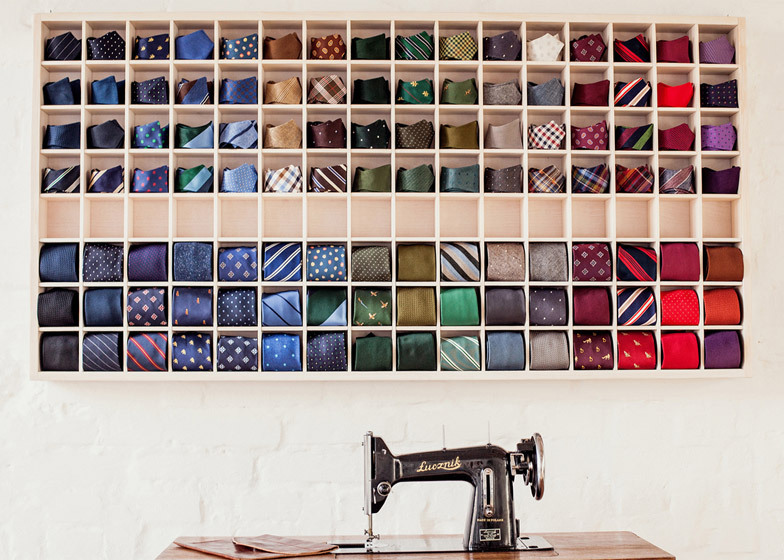 "The workplace is not isolated, it is a part of the sales area," said Krajewska Godziek. "This allows the clients to have contact with the process of product development and to learn about the company from the inside." Original brick walls have been whitewashed to provide a neutral backdrop for products displayed on vintage furniture and shelving. Photography is by Dorota Zyguła-Siemieńska.